Due to its refined interior and aggressive looks the 2017 Dodge Ram 2500 is a leading choice in the heavy duty pickup class. This combined with its amazing power and extreme towing capacities make the 2017 Ram 2500 one of the first choices for a heavy duty pickup. If all of your hauling and towing needs are being completed by a 1500-series light duty truck, the Ram 2500 can deliver additional power and become your heavy duty work machine. View the Ram 2500 Inventory! The Ram 2500 comes in several different option levels just like the Ram 1500. Options include cabin, box length, and cabin choices, all while offering abilities to tow large amounts of weight. If you’re looking for something that is more aggressive and ready to handle that next turn down a dirt road, Ram offers the Power Wagon. There are many competitors in this segment but none compare to what the Ram has to offer - a rear coil spring suspension system. Coil spring suspension systems provide a more pleasant and comfortable ride when driving around town or while towing a fully loaded trailer when compared to the harsher ride of a leaf spring rear suspension setup. The Power Wagon’s styling has been updated for the 2017 model year. Ram is also providing an updated 4WD off-road system, along with upgraded suspension systems for the Limited and Laramie Longhorn 4WD models. Also this year the 6.4L Hemi V8 is going to come as standard equipment on the Laramie, Limited, and Laramie Longhorn trim packages. The 2017 Ram 2500 is currently for sale in Oklahoma City, near Mustang, Midwest City, and El Reno, OK. The 2017 Ram 2500 is available in many different packages just like many of its leading competitors. For starters, there is a choice between two bed lengths, three cab sizes, seven trim levels, two transmissions, and three engines. The seven trim packages include the SLT, Tradesman, Big Horn, Laramie and Laramie Longhorn, Limited and the Power Wagon. From the no-frills basic work truck in the Tradesman to the luxury Limited there are many options from which to choose, making sure everyone gets the truck they want with the options that they need. The three cab styles are the standard choices that have been around for years. You can choose between a regular cab, four-door crew cab, and the larger four-door Mega Cab. The Crew Cab may be paired with either a short bed (6’4”) or the standard 8’ bed while the regular cab comes with only an 8’ bed. Due to the larger cabin size of the Mega Cab and the fact that is shares the same frame length it only comes with a special sized short bed. The most commonly equipped engine with the Ram 2500 is the famous 5.7L Hemi engine. This engine is paired with a six-speed automatic transmission and produces 383 horsepower and 400 lb-ft of torque. Depending on fleet needs, Ram also offers the 5.7L in a CNG (Compressed Natural Gas) version as well. The Power Wagon is only available in a 4WD drivetrain, while the 2500 can be equipped with a 2WD or 4WD drive train system depending on the individual customer need. There are two other options available on the Ram 2500. The 6.4L V8 produces 410 horsepower and 429 lb-ft of torque and comes with a six-speed transmission. If heavy towing is high on your needs than the 6.7L Cummins diesel engine will suit your needs. With the manual transmission, this engine produces 350 horsepower and 660 lb-ft of torque. When equipped with the optional Aisin transmission these numbers are boosted to an amazing 370 horsepower and 800 lb-ft of torque. The SLT and Tradesman can be equipped with all three cab styles while the Big Horn, Laramie, Limited, and Laramie Longhorn can only be equipped with the Mega Cab or Crew Cab. The special off-road edition Power Wagon can be equipped in a Tradesman, Laramie, or Standard models but comes in only a Crew Cab Short Bed model only. The most standard trim package is the no-frills Tradesman. This vehicle comes equipped with automatic headlights, a locking tailgate, tilt steering, 40/20/40 bench seat, and 17” steel wheels. For entertainment this vehicle comes equipped with an audio system with aux audio input, USB ports, and six speakers. Adding to the no-frills appearance are the black bumper, black grill, vinyl flooring and upholstery that come standard. If needed, a cloth bench seat is available as a no charge upgrade. The Regular Cab models come equipped with manual controls and regular mirrors while power locks, mirrors, heated and power adjustable mirrors all come standard on Crew Cab models. If the vehicle is going to live its life as a work truck, the Tradesman edition can be equipped with a Heavy Duty Work Grade vinyl upholstery. Jump up a level to the SLT model and we receive some more great features. An integrated brake controller, power sliding rear window, overhead console, carpeted floors, and Bluetooth connectivity come standard. 18” wheels, heated mirrors, satellite radio and amazing 5” touchscreen round out the great features of this package. A step up in interior comfort is the Big Horn. This package is also known as the Lone Star for customers in Texas. This edition comes equipped with a 10-way power driver seat, a leather-wrapped steering wheel, premium upholstery, 18” alloy wheels, 115V power outlet, and a limited slip differential as standard equipment. No longer standard equipment, the limited slip differential is now optional on the Laramie trim package, but it does now include the 6.4L Hemi as standard equipment. Standard features also include front and rear park assist, LED tail lights, two-tone paint, dual zone automatic climate control, leather upholstery, and a rear view camera. Adding to the vehicle’s comfort is a power front seat that is adjustable six ways, heated steering wheel, heated and ventilated front seats, and an audio system that has ten speakers. Next on the list is the Laramie Longhorn. This package includes some great features like a remote start system, center console, leather interior with wood trim, power adjustable pedals, heated rear seats, HD radio, navigation system, cream colored bumpers, mesh grille, running boards, and a spray-in bedliner. The Limited is the most luxurious package available on the 2017 Ram 2500. This package includes a chrome exterior trim, automatic wipers, automatic high beams, keyless ignition and keyless entry systems. It also comes with 20” wheels and the exclusive RamBox system. This is a unique feature that combines special bedside storage compartments and adjustable tie downs for enhanced cargo management. The Power Wagon is a special off-road themed edition version of the Ram 2500. This vehicle comes with the 6.4L Hemi and 4WD. Due to its off-road nature it has some unique features. A manual transfer case, electric locking differentials, hill descent control, and 17” wheels come standard. To assist in off-road performance this vehicle comes equipped with skid plates, tow hooks, electric front winch and a front axle sway bar that can be electronically disconnected to improve off-road performance due to enhanced axle articulation. New for 2017 the Ram 2500 can come equipped with a 4WD Off-Road Package. This is available on the Crew Cab and Mega Cab models. It equips vehicles with tow hooks, hill descent control, extra skid plate, limited slip rear differential, Bilstein shocks and either 18” or 20” off-road tires. This is where the Ram 2500 shines. Being equipped with three engine options that can haul anything that you can think of makes this truck unique. The 5.7L Hemi is rated to tow up to 13,900 lbs. depending on configuration and puts out an amazing 383 horsepower and 400 lb-ft of torque. For maximum payload capacity the 6.4L engine is the option of choice. The 6.4L Hemi is rated for 410 horsepower and 429 lb-ft of torque and is rated for up to 7,390 lbs. of payload depending on configuration. For the ultimate in towing capacities the 6.7L Cummins is the choice. 370 hp and 800 lb-ft of torque can tow up to 18,000 lbs. depending on configuration. Although the Ram 2500 is one of the most capable work trucks around it also does it in comfort. Although the base trucks are equipped with vinyl interiors, AM/FM radio, manual windows and door locks, this is mostly to satisfy the needs of fleet buyers. There are many higher end trim levels to provide things like leather interior, rear view cameras, etc. 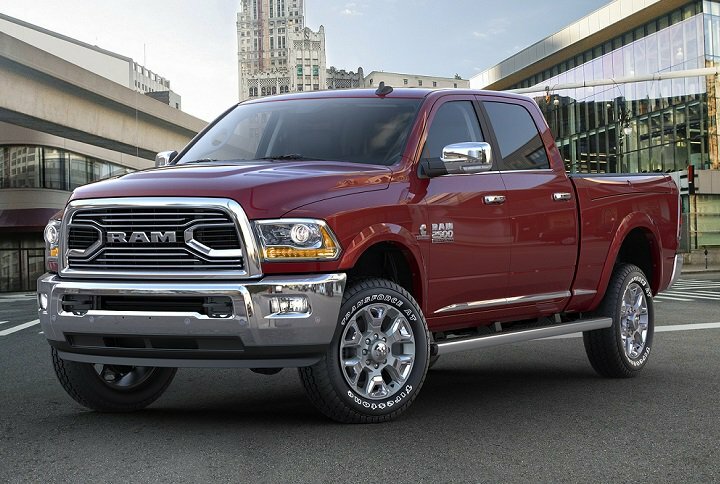 The most stunning feature of this truck is Ram’s Uconnect system. This is an up-to-8.4” touchscreen capable display that controls everything from the rear view camera to the heated seat controls. Its very straightforward smartphone-like controls make it very simple and intuitive to control. In some higher end trim levels there is enough leather to make any cattle rancher proud. Federal testing of the Ram 2500 has resulted in a four-star overall rating and a three-star rating in rollover testing for the 2017 Ram 2500 4WD Crew Cab models. Heavy duty trucks have not yet been tested by the IIHS so those results are not available, but the Ram 2500 has safety on its mind with advanced safety features like a stability control system and a full set of airbags. No matter your truck needs, the 2017 Ram 2500 has a solution. From taking a crew from jobsite to jobsite or hauling heavy loads, this truck can be outfitted to solve your problem. Test drive a 2017 Ram 2500 for sale near Oklahoma City, Edmond, Moore, and Yukon, OK to find out what these trucks are really about.